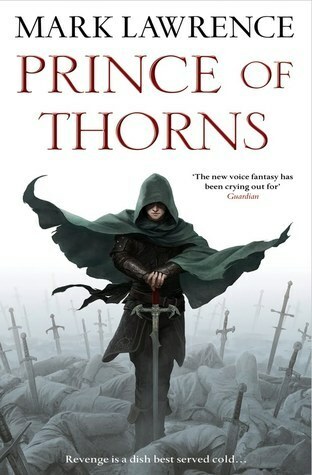 Prince of Thorns by Mark Lawrence REVIEW | Goblins, Swords, Elves, Oh My! Goblins, Swords, Elves, Oh My! Conquering the world one nerd at a time. What is this blog… ? Note: This book is not for children. Yes, it’s about a 15 year old boy. But it’s about a boy thrust into a world of blood and ruin. Not for children, or squeamish readers. If this was a movie, it would be a hard-R. You have been warned. For the last two years or so, in Fantasy groups on Facebook and beyond, I’ve been hearing quite a bit of praise for Thorns. I put it on my massive reading list for a while, and finally got to it last year. Thankfully I stopped procrastinating about reading it, and finally finished it this year. The book centers on Prince Honorous Jorg Ancrath, heir of Ancrath. When he nine years old, he witnessed soldiers belonging to Count Renar, murder his little brother and his mother, while he watched helplessly from a thorn bush he fell into. The book is told entirely from Jorg’s point of view, in the first person. (Rare for a Fantasy novel to be told from that view, but Lawrence handles the challenge beautiful.) He is cold and ruthless, yet he’s also very sarcastic and at times made me laugh out loud. And it’s largely the humor that kept me reading, and the unpredictability of Jorg’s actions. As for Jorg the character, he’s not a large brute that bashes everything that moves that you normally find in revenge stories. He is small and skinny, preferring to outthink and outmaneuver his opponents, giving him a big advantage in a world of darkness and brutality. And thankfully Lawrence writes the antagonists s of the tale the same way, and makes them just as memorable as Jorg. Another thing different about this tale is that everyone is equally capable of good and bad. A good break from clearly defined and moustache twirling characters. Even the writing style is refreshing. Descriptions are short, and to the point, moving the story along at a quick pace. As a writer, it’s a style one can and should aspire to. Overall, I give Prince of Thorns 4 ½ Stars out of 5. If you like your Epic Fantasy on the gritty side or revenge stories, you should give this book and the rest of The Broken Empire series a look. Should also appeal to fans of David Gemmell, Joe Abercrombie, and Scott Bakker. This entry was posted in books and tagged Epic Fantasy, Fantasy, Fantasy Books, Grimdark Fantasy, Mark Lawrence, Prince of Thorns, The Broken Empire. Bookmark the permalink. Want to know when a new post is up? Click sign up to find out via email! 6×6 Fortune — Live Reading of Bl00d 4ortun3!